It's finally Monday. Yeah!!! We had parities all weekend. Who would have believed it would be so tiring to have fun. Four in all I think. Two in one actually. I listed a new doll yesterday and today I have a few new paintings. Otherwise...I'll be in the studio cleaning. I decided to clean it out and get with the program. Just move on. Throw out all the junk I've been collecting and give myself some space. Maybe I'll even paint it and redecorate. I'll post photos later. I need two big friends to help me. Bruno and Big Ed. That's it! I just love the vintage angel! I love them all, but I really think she is like your paintings. Love her! Have a great day! I enjoy your blog! I do a lot of surfing looking for inspiration for my photography, and your blog has some really cool designs. Thanks for posting! Your little clay dolls are so precious! 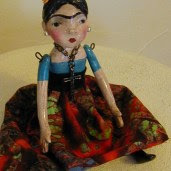 I love your dolls and your blog os beautiful! Thanks for stopping by mine too, I appreciate your comment!